If you were to ask most classical educators what classical education is, you would find them hard-pressed to give a short, coherent answer. That is the way with a lot of movements: It’s easy to get swept up in the enthusiasm, but when asked to formulate what it is that excites you, it’s hard to articulate. But when you can get an answer to the question, “What is classical education?,” it is almost always in terms of Dorothy Sayers’ trivium, her three “states of development”—the grammar stage, the dialectic stage, and the rhetoric stage. These together, we are told, are what constitute a classical education. The origin of this conception of classical education can be found in a speech Sayers gave to students at Oxford University during a vacation term in 1947, titled “The Lost Tools of Learning.” Despite the lack of attention paid to it at the time or in the succeeding decades, its republication in Douglas Wilson’s 1991 book, Recovering the Lost Tools of Learning, made it a rallying cry for thousands of classical home and private schools across the country. In her speech, Sayers discussed three “states of development” every child proceeds through in the course of his education. There is the “Poll-Parrot,” or grammar stage, which roughly approximates what we would consider grammar school, and emphasizes observation and memorization. The second, “Pert,” or dialectic stage, begins when children start to contest and argue. Then comes the rhetoric, or “Poetic” stage. Whereas memorization is the dominant mode in the grammar stage, and analysis in the dialectic stage, synthesis is the dominant mode in the rhetoric stage. There is no doubt that Sayers’ simple and easy-to-remember formula was the key factor in the rise of the modern classical education movement. But classical educators who employ this formula should be careful how they use it in any explanation of what classical education actually is. 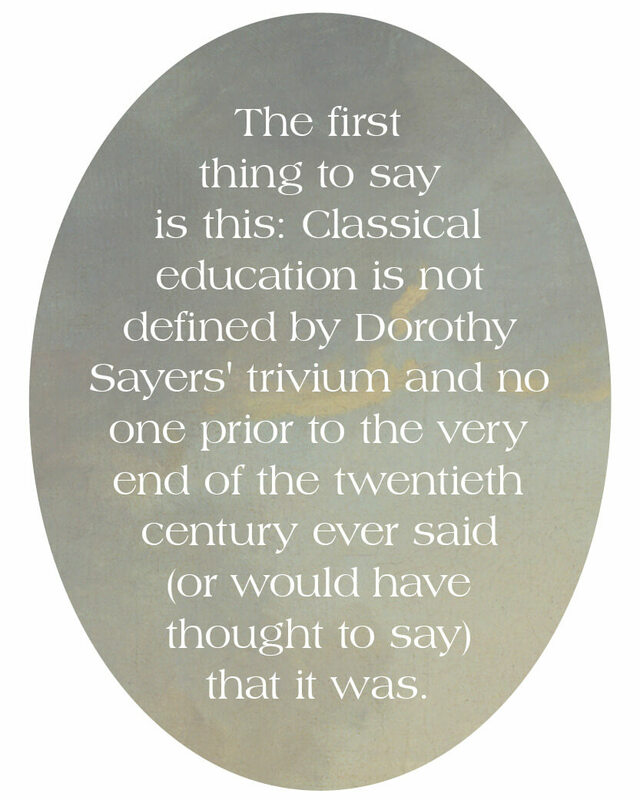 The first thing to say is this: Classical education is not defined by Dorothy Sayers’ trivium, and no one prior to the very end of the twentieth century ever said (or would have thought to say) that it was. Nor did Sayers herself ever explicitly identify her states of development as classical education—in her speech or anywhere else. In fact, the term “classical education” does not even appear in her essay. Sayers’ trivium is only about seventy years old, while the origin and practice of classical education goes back well over two millennia. Sayers’ developmental trivium was never consciously put into practice until the 1990s, well after classical education had been knocked from its long-held position as the primary understanding of what education is. Hers, she says, is “a modern trivium [my emphasis] with modifications.” Her curriculum was not the Medieval but the “neo-Medieval” curriculum. We should consider what is “modern” about her modern trivium and what is “neo” in her neo-Medieval curriculum. And we should ask what is the nature of the relationship between Sayers’ trivium and classical education as it has always been known and as it is properly understood. Sayers does not try to explain what classical education is in her speech. That is not even remotely her purpose. And her audience would have associated classical education, not with anything new she was proposing in her speech, but primarily with the reading of the Great Books in their original languages, and secondarily with the mastery of the liberal arts. Her audience also would have understood that the trivium she was proposing was something different from the classical trivium. The classical trivium had traditionally been seen as a simple listing of the first three liberal arts (those intellectual arts related to language), which, along with the mathematical arts of the quadrivium (arithmetic, geometry, music, and astronomy) made up the seven classical liberal arts. The classical trivium—grammar, logic, and rhetoric—was a taxonomy of intellectual skills, proceeding from the simple and most basic language skills to the more complex and sophisticated. Grammar taught students how language was structured, logic how to use language in the construction of valid arguments, and rhetoric how language could be used for the purpose of persuasion. Sayers’ trivium uses the terminology of the classical trivium, but produces something entirely different. Hers is a developmental trivium: The classical trivium is a taxonomy of skills subjects, but hers is a taxonomy of learning. It is focused on the intrinsic developmental psychology of students, not the extrinsic content of an educational program. Sayers’ move constitutes a Copernican shift in the understanding of education by making the subject of her taxonomy not knowledge, but the process of learning—not what, but how children learn. And what is, if not non-classical, then at least somewhat new and unique, is the position her taxonomy occupies in her overall philosophy of education. Sayers’ approach to education was very much in line with the psychological emphasis of the later nineteenth and early twentieth centuries as it was manifested in John Dewey’s psychological educational emphasis. Like Dewey, Sayers’ educational philosophy is “child-centered.” Her trivium is framed, as she herself states, in terms of modern “child psychology.” This is one of the huge shifts in emphasis that marks off modern thinking from distinctively classical thinking. No educator before the nineteenth century would have thought to even frame education in this way. Historically, the developmental psychology Sayers assumes simply played little or no role in the classical concepts that dominated education thinking prior to the mid-nineteenth century. Classical educators were focused more on the content they were teaching the child, and the purpose for which they were teaching it, than on the developmental state of the child. Sayers, like Dewey, places the process of education above its content and purpose. We moderns are obsessed with methodology. We think that the way we do something is just as—if not more—important than what we are doing—or why we are doing it. Are we really to believe that the tools of learning are the only things that matter in an education? In classical education, the old liberal arts were important, but they were merely the “handmaids” of learning. They played only one role, and a subordinate one, in the drama of learning. They constituted its means, not its end. Sayers confuses the means of education with its end, or perhaps more accurately, she considers the means the end itself. In the modern educational world, where technique trumps teaching, Sayers’ trivium provides classical educators with a method we can call our own. Instead of repudiating the Modern Madness of Method we settle for saying, “My method is better than your method.” This is not a classical impulse. The classical impulse is to focus primarily on the ideal person we are trying to form and the models by which this may be done, and only secondarily on the process by which this is accomplished. It is not that Sayers’ insights are not valuable (they are) or that they should not be considered useful (they should). But we must realize that her insights are secondary, not primary, to the educational enterprise. Classical education is the inculcation of wisdom and virtue through a facility with the liberal arts and a familiarity with the Great Books. St. Thomas Aquinas defines wisdom as “ordering things rightly.” If we grant this, then the relation between Sayers’ trivium and classical education as it has always been conceived comes into better focus. Process and content are not mutually exclusive. What is needed is a proper balance between the two, but a balance that places an unambiguous emphasis on the content that forms the student’s soul. We cannot exclude method altogether—that would not be wise. But neither can we exalt the process of education above its purpose. How many times do we invoke Dorothy Sayers in contrast to the number of times we appeal to Shakespeare, Dante, Aristotle, St. Paul, and Homer? We have little justification to claim we are better than modern educators if all we do is replace an emphasis on Dewey with an emphasis on Dorothy Sayers. Make no mistake: Dorothy is better than Dewey. But neither one should trump the tradition. Neither one, however right or wrong, stands taller than the giants on whose shoulders we all stand. 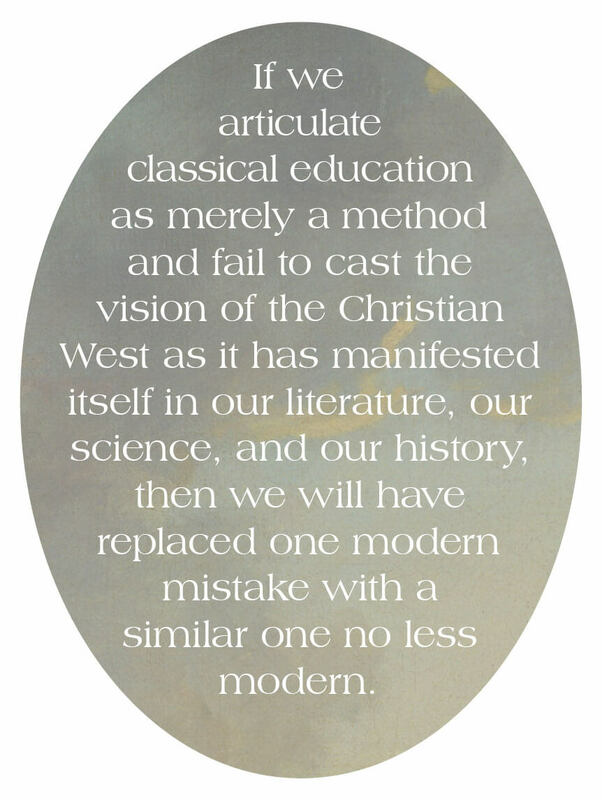 If we articulate classical education as merely a method and fail to cast the vision of the Christian West as it has manifested itself in our literature, our science, and our history, then we will have replaced one modern mistake with a similar one no less modern. As we strive to find the right words to describe what we are doing—to our fellow educators, to parents at our schools, and to ourselves—we need to properly balance the appeal of a sound method with an articulation of what that method is designed to achieve. We think that parents are going to respond to our Dorothy Sayers “three stages of learning” presentation, when, in fact, they will respond even more hungrily to our call for them to enroll themselves and their children in the fateful defense of Western Christian culture. We live in the cultural twilight of a great civilization in which a growing darkness is increasingly blinding us to the wonders of creation and the nature of who we are as beings created in the image of God. It is a battle that will require far more than a mere method. Martin Cothran is the Director of the Classical Latin School Association and the editor of Memoria Press's Classical Teacher magazine. He is the author of several books for private and home schools, including Memoria Press's Traditional Logic, Material Logic, and Classical Rhetoric programs, as well as Lingua Biblica: Old Testament Stories in Latin. He is a former Latin, Logic, and Rhetoric Instructor at Highlands Latin School in Louisville, Kentucky. He holds a B.A. in philosophy and economics from the University of California at Santa Barbara and an M.A. in Christian Apologetics from the Simon Greenleaf School (now part of Trinity University). He is widely-quoted on educational issues and other issues of public importance, and is a frequent guest on Kentucky Educational Television's "Kentucky Tonight," a weekly public affairs program. His articles on current events have appeared in numerous newspapers, including the Louisville Courier-Journal and the Lexington Herald-Leader. Well stated. Keep up the good fight, Martin.